Miami returns to Oxford after a four-game road trip to take on Alaska Friday, Oct. 31 and Saturday Nov. 1. Both games will start at 7:05 p.m. and will be televised on the Ohio News Network. Miami leads the all-time series against the Nanooks with a record of 30-12-4, and the RedHawks lead the series in Oxford 16-5-2. Miami has won the last two meetings and three of the last four, but last season Alaska split the two-game set in Oxford with a shutout of the RedHawks on Dec. 7, 2007. This was the last time Miami was shutout. Even with the shutout Miami was able to outscore Alaska a season ago 12-6 including 7-2 win by Miami in the final meeting of the season. This is the earliest in the season Miami and Alaska have played a game since 1997. That season, the Nanooks and the RedHawks faced off Oct. 25. Following a big weekend sweep of Notre Dame, Miami sophomore Andy Miele was named the CCHA Offensive Player of Week. Miele found his way to the score sheet for the first time this season in the two-game set against Notre Dame. Miele did all but score last weekend for the RedHawks as he got his first point of the season in game one when he weaved through two players and left it in front of the net for Pat Cannone. Miele then picked off a Notre Dame clear attempt and found Gary Steffes in the slot to give Miami a two-goal lead. The next night, Miele fired a shot from the left faceoff circle and was credited with a goal until a review showed that Gary Steffes made a tip in front and earned the goal. The conference honor is the second conference honor of Miele’s career as he earned Rookie of the Week honors in the final week of the regular season last season after posting a goal and three assists against Ohio State. Coming into the 2008-09 season, Gary Steffes had scored 11 goals in his Miami career. Steffes had netted five as a freshman and six more during his sophomore campaign a season ago. After six games this season, Steffes already has five goals and is tied for the lead in CCHA overall goal scoring. Steffes and the RedHawks return to Steve Cady Arena this weekend the sight of his biggest offensive explosion this season. In the second game of the year, Steffes netted a hat trick against Ohio State in the RedHawks’ 7-3 win. The RedHawks traveled 2,367 miles in the first three weekends of their season as five of Miami’s first six games where on the road, including trips to Burlington, Vt., Columbus, Ohio and South Bend, Ind. The Red and White handled the road well as they went 2-1-2 in their first five road game, including a two-game road sweep of No. 13 Notre Dame. Notre Dame boasted one of the nation’s top power-play units coming into the two-game set with the RedHawks. Miami put a stop to the Fighting Irish’s power play as they held them to 0-16 on the weekend. Since giving up a 5-on-4 goal on the first penalty kill of the season, Miami has not allowed a 5-on-4 goal, going 37-of-38 on the penalty kill, allowing one 5-on-3 goal against Vermont. >D1hockey.com? It’s a great resource for Division I hockey information. Basic membership is free and worth checking out. Actually, the site is something to behold. Very well organized and informative. > The latest LA Kings Prospect Update has been posted on the club’s official web page and it profiles on man in particular…Jeff Zatkoff. As we know, Zats has been very impressive with Ontario of the ECHL thus far, and one would think he’d be in line for a call from Manchester sometime soon, but I digress. Let’s hope that “JZ” doesn’t stick around in the ECHL for two years! If you’re interested in reading the rest of the Prospect Update (there is more on Zatkoff), click here. 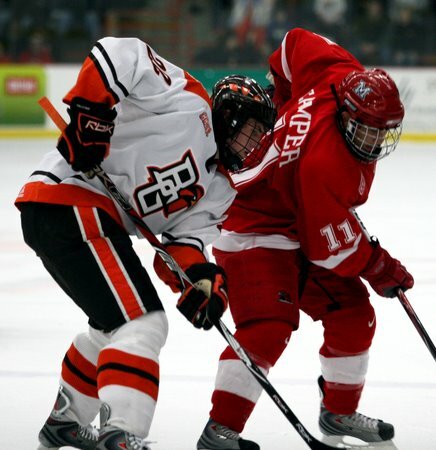 >RedHawks Honored and Carter Camper…for Hobey? > – After a sweep of Notre Dame this weekend, our RedHawks are getting some well deserved praise. College Hockey News has picked Miami as the Team of the Week. Though it’s still early, Miami has proven a lot already — getting a close loss and tie at hostile Vermont, then going into Notre Dame this past weekend and sweeping. It was a complete weekend, with key scoring; strong defensive play from the vets, newcomers and forwards; and solid goaltending from the young goaltenders. As a result, Miami is the CHN Team of the Week. The article also offers a nice perspective from Andy Miele. I encourage you to read the rest of it, at this link. Carter Camper was a big hit last season with the likes of Dave Starman, Matt McConnell and Adam Zucker from CBS College Sports, who took turns touting the Rocky River, Ohio native on their Hobey Watch ballots. Of course, broadcasters have more than one reason to like Camper, as “Carter Camper” does tend to roll off the tongue a fair bit easier than, say, “Matti Kaaltiainen,” but when a guy is coming off a 41-point freshman season in which he was also a +21 for his team, you have to imagine a shot at the Hobey isn’t out of the question. Meanwhile, fellow RedHawk center Pat Cannone turned heads with a six-point effort against Ohio State in the second game of the season – the first such game at Miami in 21 years – and when a player can put up six points in one night, it’s certainly worth taking a look. To read the rest of Olshansky’s column, as well as the rest of the article about Carter Camper (what I posted is only a short excerpt), click here. You can see Tommy’s answers to the other 19 questions at this link. > Former RedHawk goaltender Jeff Zatkoff has been named the RBK Goalie of the Week in the ECHL. 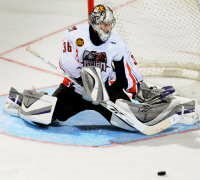 Zatkoff, a member of the first-year Ontario Reign, is undefeated in this early season. Ontario Reign rookie goaltender Jeff Zatkoff is the RBK Hockey ECHL Goaltender of for Oct. 20-26. He was a runner up for the award last week after making 29 saves in his first professional start, a 2-1 win at Bakersfield on Oct. 18. 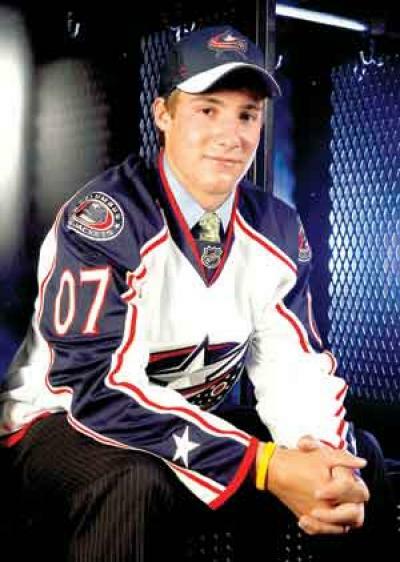 Selected in the third round (74th overall) by Los Angeles in the 2006 NHL Entry Draft and under NHL contract to the Kings, the 21 year old was 2-0-0 with a goals-against average of 1.50 and a save percentage of .954 against defending National Conference champion Las Vegas. After making 28 saves in a 4-2 win at Las Vegas on Thursday, Zatkoff had 34 saves in a 4-1 win on Saturday as the Reign won their first game in the new Citizens Business Bank Arena. In his first three professional starts he is 3-0-0 with a goals-against average of 1.33 and a save percentage of .958. He is tied for the league lead in wins and ranks third in goals-against average and save percentage. 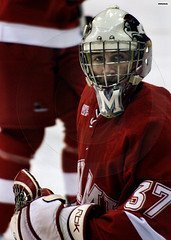 Zatkoff played the last three years at Miami University where he was 55-21-5 with seven shutouts, a goals-against average of 1.93 and a save percentage of .927 in 82 games. Runners Up: David Shantz, Dayton (2-0-0, 0.50 GAA, .979 save pct.) and Jean-Phillippe Lamoureux , Alaska (1-0-0, 0.00 GAA. 1.000 save pct.). – Congratulations to Andy Miele, as he is the current CCHA Offensive Player of the Week. Miele (0-3-3, +2) assisted on both goals in Friday’s 2-0 win and the opening goal of Saturday’s 3-2 decision as the RedHawks swept at Notre Dame. 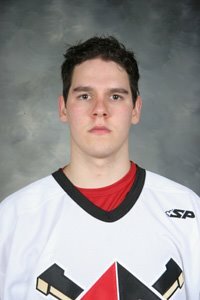 > – Former RedHawk defenseman Mitch Ganzak carried his share of the load by adding four assists as the Wheeling Nailers defeated the Cincinnati Cyclones on Friday night, 9-7. With tonight’s totals, Ganzak now has a total of four assists on the season and is seventh in the ECHL among the assist leaders. – Another good night for another RedHawk defenseman as Alec Martinez scored his first professional goal in a 3-2 Manchester win on Friday night over the Wilkes-Barre/Scranton Penguins. Martinez’ tally came on the power play, in the third period and was the game winner.